A canvas print comparing Gold Street in 1914 to the same street 100 years later was unveiled at the launch of a new community and training centre. 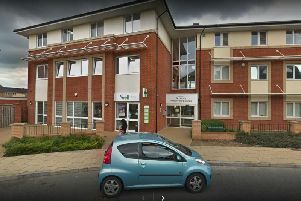 The centre, which is managed by the charity, Friendship Zone, now operates out of premises at 60 Gold Street. Founder, Paul Kuznecovs, said the opening was a “dream come true”. “When I first started Friendship Zone, my dream was to have a charity that helps people achieves their own dreams. Then that developed into the idea of having a training and community centre, that offered services to help people. Now I am very proud to say that we have achieved that,” he said. The businesses that utilise the space range from charities, to employment agencies, training and educational organisations, immigration assistance and a business offering music therapy sessions. All of the revenue generated from businesses renting space in the building is used by Friendship Zone to help general public and UK-registered charities through micro grants and donations.